You can take advantage of the photos on the iPad in a few more ways. In each case, you tap the picture and make sure the picture controls are displayed. Then tap the share icon to display these choices. Look at what else you can do! AirDrop: AirDrop is a neat wireless method for sharing photos, videos, or other files with folks who happen to be nearby and also have an iOS 7 or later device or a Mac running Yosemite, El Capitan, or Sierra. You turn on the feature in Control Center and choose whether to make your iPad discoverable to everyone or just contacts who are in the vicinity. Tap a photo to select it and then tap the photo or icon representing the person and the device with whom you are trying to share the image. That person will receive an invitation to accept the photograph or reject it on his or her device. If the photo is accepted, the picture lands on the person’s phone almost immediately. Message: Apple and your provider support picture messaging through MMS (Multimedia Messaging Service). Tap the Message option, and the picture is embedded in your outgoing message; you need to enter the phone number, email address, or name of the person to whom you’re sending the picture. If that person is using an iOS 5 or later device, the photo will be sent as an iMessage, which doesn’t count against your texting allotment. Mail: Some photos are so precious that you just have to share them with family members and friends. When you tap Mail, the picture is embedded in the body of an outgoing email message. Use the virtual keyboard to enter the email addresses, subject line, and any comments you want to add — you know, something profound, such as “Isn’t this a great-looking photo?” After tapping Send to whisk picture and accompanying message on their way, you have the option to change the image size (small, medium, or large) or keep the actual size. Consider the trade-offs: A smaller-sized image may get through any limits imposed by your or the recipient’s Internet service provider or company. But if you can get the largest image through, you’ll give the recipient the full picture (forgive the pun) in all its glory. Notes: You can add your chosen image to the Notes app. iCloud Photo Sharing: You can post pics to a shared album. Twitter: Lots of people send pictures with their tweets these days. The iPad makes it a breeze. Tap Twitter and your picture is embedded in an outgoing tweet. Just add your words, sticking to Twitter’s character limit of 140, and tap Post. Facebook: Lots of people also share photos on the world’s largest social network. After your Facebook account is configured, you too can post there from your iPad. Sina Weibo and Tencent Weibo: If you’ve enabled a Chinese keyboard, you’ll see options for China’s own social networks. Flickr: The Yahoo!-owned service is another popular photo-sharing destination. Save PDF to iBooks: You can turn the image into a PDF that you can stash in the iBooks app. Copy: Tap to copy the image and then paste it into an email or elsewhere. Duplicate: You may want to duplicate a photo so that you can edit it while also keeping an original. Slideshow: Here is another starting point for a slideshow, which as you know, can be accompanied by an optional musical soundtrack. AirPlay: Own an Apple TV set-top box? You can use AirPlay to stream photos from the tablet to the TV. Save Image: If you didn’t shoot the image in question on your iPad but want to add it to the device, tap the Save Image option. Hide: Don’t want the image to be seen (but don’t want to delete it either)? Tap Hide and then tap Hide Photo. The selected pic will be hidden from the Moments, Collections, and Years views but still visible in Albums. Assign to Contact: If you assign a picture to someone in your contacts list, the picture you assign pops up whenever you receive a FaceTime call or Message from that person. Tap Assign to Contact. Your list of contacts appears on the screen. Scroll through the list to find the person who matches the picture of the moment. As with the Use as Wallpaper option (described next), you can drag and resize the picture to get it just right. Then tap Set Photo. You can also assign a photo to a contact by starting out in Contacts. To change the picture you assigned to a person, tap his or her name in the contacts list, tap Edit, and then tap the person’s thumbnail picture, which also carries the label Edit. From there, you can take another photo with the iPad’s digital camera, select another photo from one of your albums, edit the photo you’re already using (by resizing and dragging it to a new position), or delete the photo you no longer want. Use as Wallpaper: The Apple-supplied background images on the iPad can’t measure up to pictures of your spouse, your kids, or your pet. When you tap Use as Wallpaper, you see what the present image looks like as the iPad’s background picture. You’re given the opportunity to move the picture around and resize it, through the now-familiar action of dragging or pinching against the screen with your fingers. You can even see how the picture looks against the time and date that appear on the lock screen. Another option is to take advantage of the Perspective Zoom setting, which lets you exploit a parallax animation effect in which the picture moves as you move the iPad. Tap the screen to toggle the setting on or off. When you’re satisfied with what the wallpaper looks like, tap the Set button. 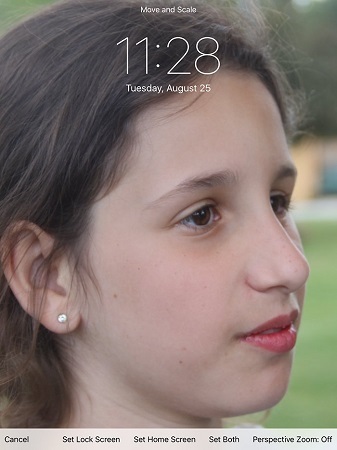 Options appear that let you use the photo as wallpaper for the lock screen, the Home screen, or both. Per usual, you can also tap Cancel. Print: If you have an AirPrint-capable printer, tap Print to print the photo. You can choose how many copies of the print you want to duplicate. More: Tapping here lets you post pictures to other sites with sharing plug-ins or extensions. Beautifying the iPad with wallpaper. Sometimes you want to make decisions about multiple pictures at the same time, whether you’re sharing them online, copying or printing them, adding them to a new album, or deleting them in bulk. Here’s a convenient way to do so. Launch the Photos app and either tap a specific album in the app or open up to a moments view so that you see thumbnails of your pictures. Next, tap Select at the upper right, and then tap each thumbnail on which you’re planning to take action, so that a check mark appears. As you do, the count for each picture you select increases. From here, you can delete them, or you can tap the share icon to share pictures on a social network in bulk, email them, send them via a message, or copy or print them, as discussed previously. The options that appear may vary depending on how many pictures you’ve selected — for example, the number of photos you can email is limited. 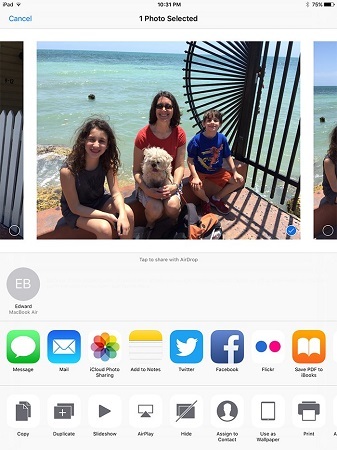 You won’t have to tap the share icon in every case to add pictures to a designated album or to delete them. After making your picture selections, look for Add To and the trash can icon at the top of the screen. Tap Add To and then, from the list that appears, tap the album where you want the pictures you’ve chosen to land. If you tap the trash can icon instead, you can dispose of the selected photos.